A Strat for Friday #105 - FCS Bettie Page Strat by Pamelina H.
Artist Pamelina H. has done TWO Bettie Page Strats for Fender Custom Shop. 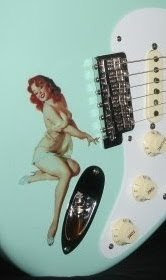 Click the above image to see the Bettie Page Stratocasters by Pamelina H. Some current news releases also show a Bettie Page Tele. These guitars are gonna skyrocket now! Bye Bye Bettie! They say blondes have more fun, but YOU scored two Strats! !